Edward was the eldest son of King Alfred the Great and Queen Elswith. At the age of twenty-two, he appears to have married a noblewoman named Egwina, though the wedding may have been uncanonical and was not recognized in some quarters. They had three or four children. At the same time, Edward was already active in his father's campaigns against the Vikings and towards the end of Alfred's reign, he was probably appointed Sub-King of Kent. Edward's path to the throne was not altogether smooth. Upon his father's death in AD 899, a rebellion broke out in favour of Edward's cousin, Aethelwold, the son of the late King Aethelred I. 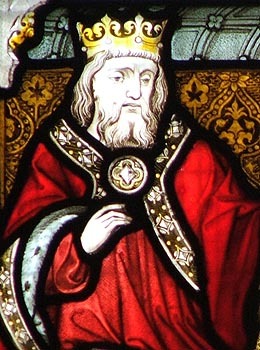 Failing to secure Wessex, this prince went north and found support from the people of the Norse Kingdom of York, where he was proclaimed King. With the help of the East Anglians, he subsequently attacked both Mercia and Wessex but was killed at the Battle of Holme (Essex) in AD 902. Around the same time, the King married for a second time to Aelflaed the daughter Ealdorman Aethelhelm of Wiltshire. They had eight children together. Four years later, Edward made peace with the Northerners at Tiddingford in Bedfordshire; but by AD 909, he took on a more aggressive stance by raiding the North-West. The following year, a joint Mercian and West Saxon army marched north and defeated the Northern Vikings so completely at Tettenhall (Staffordshire) that they subsequently felt it best to remain within their borders. King Edward was then able to concentrate his attentions on the Danes of East Anglia and the Five Boroughs (of the East Midlands). With the help of his sister, the formidable Lady Aethelflaed of Mercia, the next eight years saw a prolonged campaign aimed at pushing the boundaries of Wessex and Mercia northwards. This was largely achieved through the extension of King Alfred's old policy of building defensive burghs across the country, as recorded in the 'Burghal Hidage'. They were both places of refuge in time of attack and garrisoned strongholds from which assaults could be launched. After Aethelflaed's death in AD 918, Edward was able to take advantage of his niece Aelfwinn's minority and brought Mercia under direct Wessex control. Two years later, the Kings of the north - including Sigtrygg Caech (the Squinty) of Norse York, Constantine II of the Scots and Donald mac Aed of Strathclyde - met Edward at Bakewell and also finally recognised his overlordship. At the time of his third marriage, to Edith daughter of Ealdorman Sigehelm of Kent, therefore King Edward was in a strong position. Holding his territories together was not easy, however, and revolts against Edward's rule continued. In AD 924, he was forced to lead an army north once more to put down a Cambro-Mercian rebellion in Cheshire. He died at Farndon-upon-Dee in that county on 17th July. Edward's body was taken south to the reduced diocese of Winchester for burial - he had sub-divided the West Saxon sees in AD 909, creating new Bishops of Ramsbury & Sonning, Wells and Crediton. The King was interred at the family mausoleum, his own foundation (AD 901) of New Minster in the centre Winchester, and was succeeded by his sons, Aelfweard and Aethelstan.